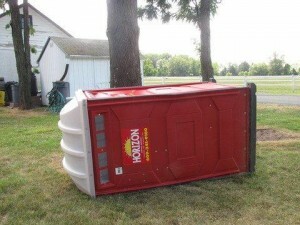 What would you do if your portable toilet had a spill? Operations that utilize portable toilets should have an emergency containment plan in place and all workers should be familiar with this plan. The goal of this plan is to contain the spill to the immediate area around the portable toilet and to prevent contamination of production areas. In the case of a portable toilet spill, one acceptable plan would be to immediately call the portable toilet service company and to build an earthen dam around the spill area to prevent further movement of the spilled contents. Think about your portable toilet locations, how you would handle a spill situation and make sure that your workers are aware of the plan.